Discussion Super Worm Moon Rising over Bellingham, Wash.
Super Worm Moon Rising over Bellingham, Wash. The Super Worm Moon rises over Bellingham and Fairhaven on Wednesday evening March 20, 2019, as seen from Lummi Shore Drive in Whatcom County, Wash.
That's a lovely image! You did some fine work here, love the reflections in the water & the twinkle lights on the hillside. I do wish the watermark was in the bottom corner so we could better appreciate the image. It's quite distracting. None the less, you've created a gorgeous piece of art here! Epic capture! Now this is kind of moon shot I want! 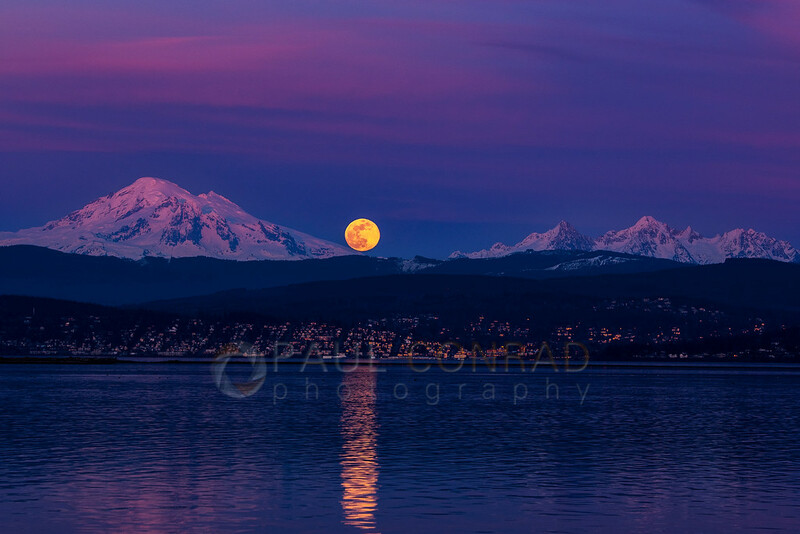 Beautiful capture of Mt Baker and the surrounding peaks. Wonderfully exposed, and composed. That is beautiful! The reflection is sweet and the soft light on the snow caps too. Very nice.